Some 70% of seniors spend the rest of their life in the place they celebrated their 65th birthday. Think about that for a minute. It means that the log or timber frame home that you are planning to build will most likely be the home you live in for the rest of your life, and that is a good thing. However, with that in mind, your home should be designed to support the physical and sensory changes that older adults encounter as we age. 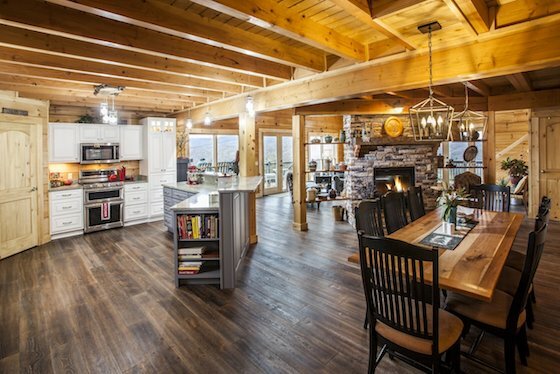 Our Honest Abe designers can prepare plans that take into account age-related conditions such as reduced mobility or limited range of reach without sacrificing the beauty of a custom wood home. Below is a checklist of options to discuss with our designers and your builder. You’ll still have the home you’ve always wanted, but forever can be much more comfortable from a place where you can age safely. Get in touch with an Honest Abe Sales Rep or Independent Dealer to begin the discussion. Ideas for making a log or timber frame home safe for aging in place without compromising beauty.